During my marathon running experiences I have come into contact with so many wonderful people who run for various purposes. Some run for their health, some run because it keeps them sane, and others like my friend runs for her daughter’s school. Below I would like to share with you all a telling story about a strong woman and mother who was diagnosed with cancer during her marathon training. I was all set to go running that morning when I remembered that I had a doctor’s appointment to attend to first. Of course I did not want to go; I have always had a healthy fear of doctors. All they do is give you bad news! However, I had been training for my marathon for six months and I was in the best shape of my life. I was actually looking forward to showing off those pesky heart scans and kicking the crap out of the air when the doctor hit my knee with that little rubber hammer. He would smile and continue the motions of this visit, but both he and I would know that this is completely unnecessary. We would spend the time talking about this and that and my superhero-ness, and then I would jump up off of the table, ready to go train again. Well, as soon as I walk in, Mr. Bad News himself takes me away from the table and pulls me into his office. He says that he was glad that I could come by today and that he had something to share with me. He gave me his prognosis for mesothelioma. He asked me if I had been feeling short of breath lately or if I found it difficult to sustain prolonged activity. As he was saying these things, darn him, I did recall that my training had seemed to plateau for quite some time, and I had found myself short of breath after running businesses that I had been accustomed to before. He looked very thoughtful as I explained all of this to him, nodding every once in a while and jotting something in a notepad of his. All of this calm behavior on his part was making me increasingly jittery. I asked him what I should do. And I have not stopped running since. I am still training for my kid’s marathon. I am sharper than ever because my mind is in the process now. I am able to push myself farther even though my physical limitations should be greater. This is perhaps the best that I have ever performed under pressure. I actually want to thank the doctor; because I never would have known how much pressure I was actually under if not for his bad news. And I never would have known how easy it is to overcome that pressure through sheer force of will and a positive outlook. I have reconsidered my position on doctors and bad news. I find both incredibly inspiring now. 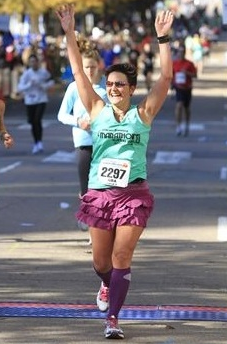 When I crossed the finish line of that marathon, I felt like I had just won the Olympics. My daughter was screaming and cheering, and though she didn’t know it, I had just earned tens of thousands of dollars to help her school. And I really think that I would not have been able to do it without a mesothelioma prognosis – who would have thought? Jackie Clark joined the Mesothelioma Cancer Alliance in 2009 as research assistant after graduating with a bachelor’s degree in English and a minor in fitness and nutrition. Jackie’s experience in technical and medical research has allowed her to assist in the development of medical content and outreach efforts, with specializations in alternative care, cancer support programs, and social media campaigns.